UPDATE: In addition to the teachers who leave voluntarily, the district also terminated 93 teachers on May 20, 2015. While I do not currently seem to have the exact numbers of teachers were were terminated in 2014, on average the district terminates about 100 teachers every year. This raises the total number of teachers gone over the past two years to 652. According to the 2016 Budget hearing, the district receives funding for 1,291.60 Teacher Units and 1,440.60 Certified Units. This is down from 1,306.67 Teacher Units and 1,459.17 Certified Units in 2015. While this is does not represent the total number of teachers the district hires, it is fairly close. I will work on getting a more accurate count. Last year was a terrible year for educators leaving from our district. This year is twice as bad. I wrote Mr. Giles requesting a total of 30 numbers to support these slides. He declined to produce those numbers. He did, however, suggest that I could look up all the information on my own via the Human Resources reports that are voted on and approved in every board meeting and work session, but that aren’t available electronically to the public. 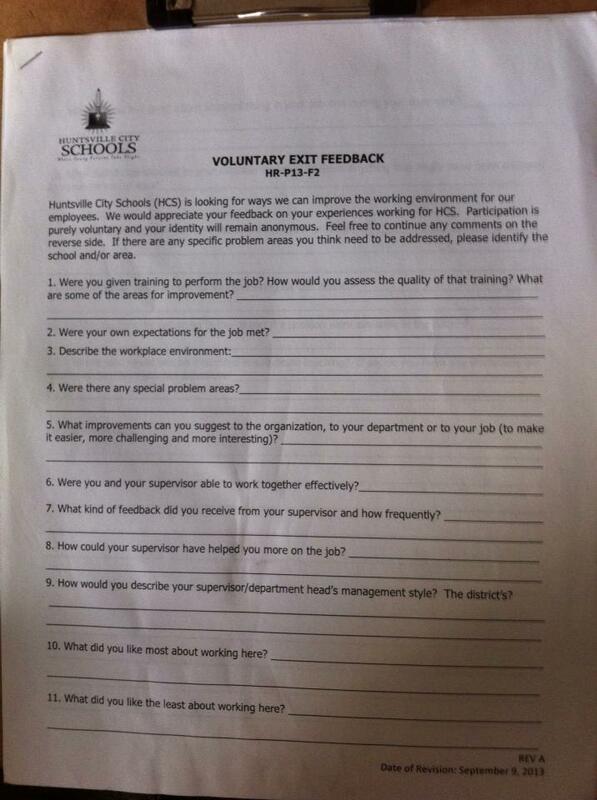 If I wanted to review the HR reports, I would have to go to Merts and request them at a cost of $0.25 per page. Over the past two years, there have been fifty HR reports containing a total of 622 pages. I have now obtained these HR reports dating back for the past two years to May 1, 2014 through May 5, 2016 (the most recently approved report). 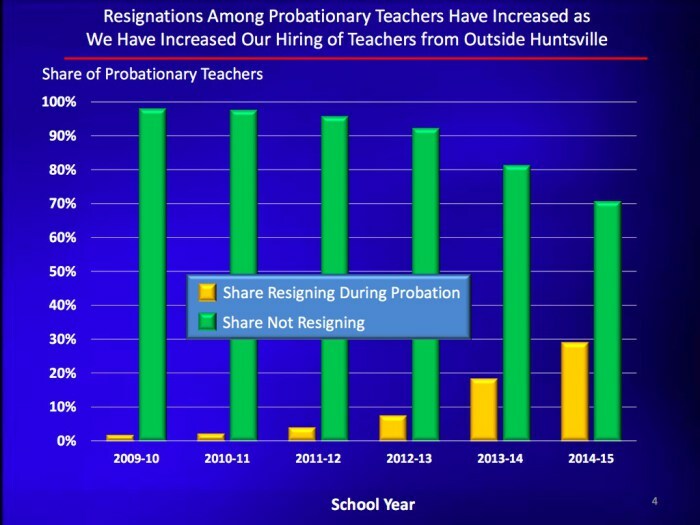 As you can see from the image at the top of the page, from May 1, 2014 through May 5, 2016 there have been a total of 423 certified employees (teachers primarily) who have resigned and 136 certified employees who have retired. A total of 559 educators have left the district by either retirement (24%) or resignation (76%) over the past two years. There have also been 150 certified employees (staff) to resign (76) or retire (74) over that period. Additionally, there were 7 revised resignation dates (duplicates removed), one rescinded resignation, and sadly three deaths. Perhaps if the board of education had done their job of actually reviewing the HR Reports before unanimously approving them, they would have at a minimum caught some of the numerous errors I found in the reports. 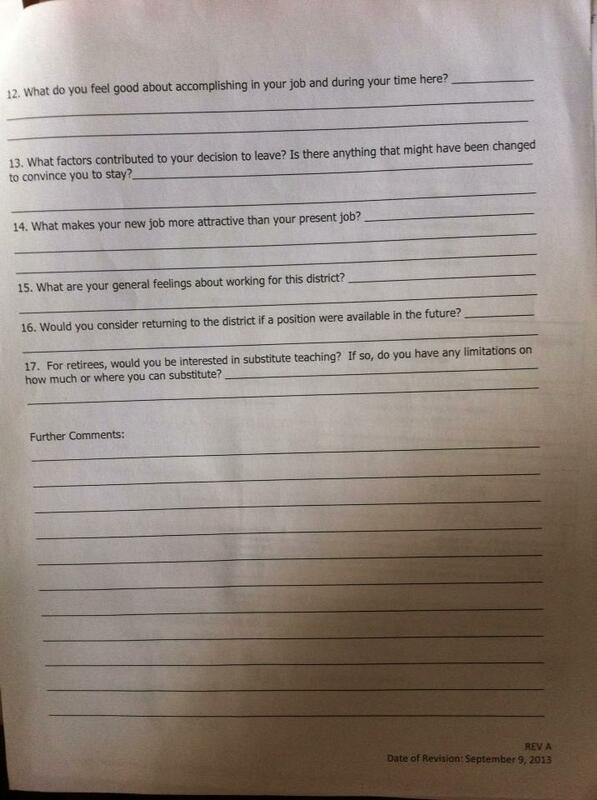 Hoping that they might care enough to ask why so many teachers are leaving the district seems a waste of time at this point. 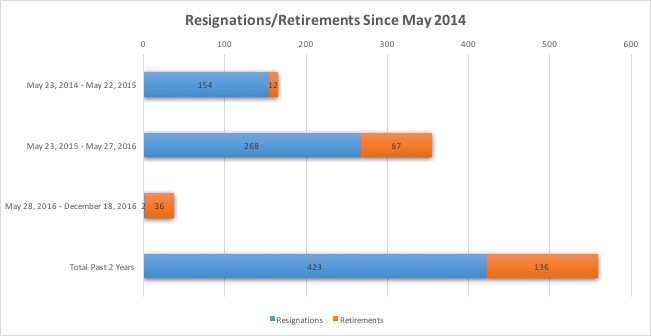 If we look at the effective date of the resignation or retirement, between May 23, 2014 and May 22, 2015 (the beginning and end of the 2014-15 school year) there have been 154 resignations and 12 retirements. 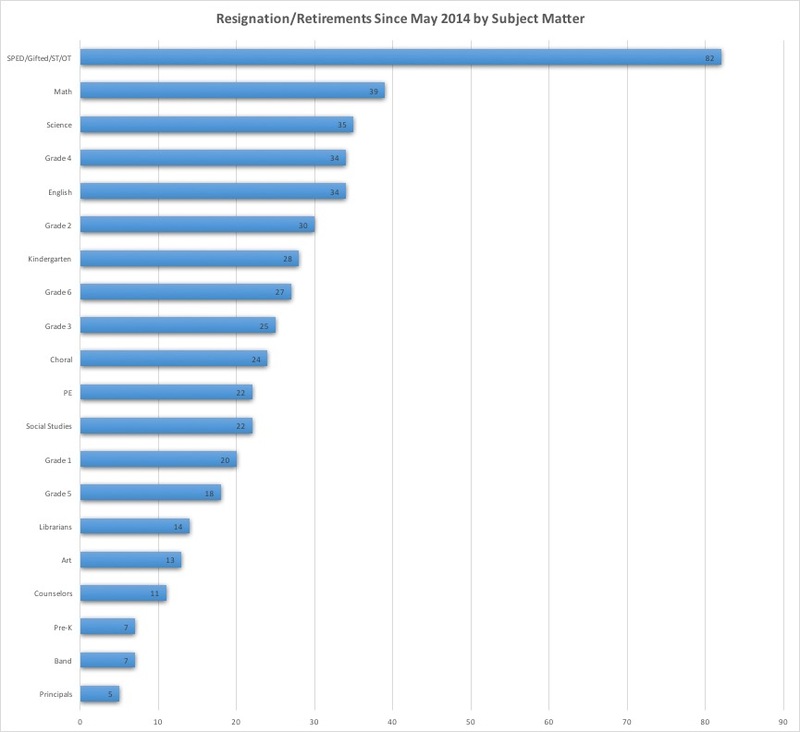 Between May 23, 2015 and May 27, 2016 (the last day of school for teachers) there have been 268 resignations and 87 retirements. 38 educators have announced their resignation (2) or retirement (36) between May 30, 2016 and December 18, 2016. In other words, twice as many certified personnel are leaving the district this year as compared to last, so far. If history is any indicator, there will be many more resignations/retirements scheduled for May 27, 2016 at the next two or three board meetings. If we look at strictly those teachers who left during the school year (between the first teacher reporting day and the last day of work for teachers) we find that between Tuesday, August 5, 2014 and Friday, May 22, 2015, 66 educators resigned (55) or retired (11). Between Tuesday, August 4, 2015 and Thursday, May 26, 2016, 108 educators resigned (92) or retired (16), so far. Again we see that during the school year when their absence would have the greatest impact on students, 42 more teachers have left the district this year as compared to the previous year. This number, by the way, does not include the number of teachers who have been moved from their classrooms this year or who have been granted extended leaves of absence. In short, if you thought that your kids’ classrooms were being disrupted at a higher rate than usual this year, you were right. 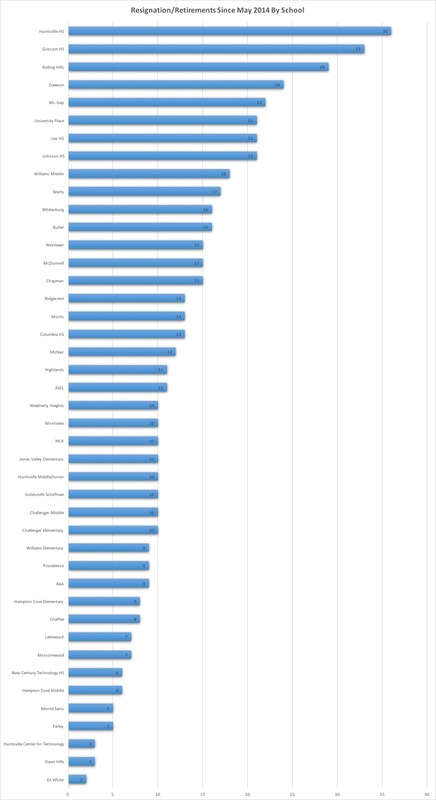 Here’s a chart showing which disciplines have been hit the hardest. As you can see, more than twice as many special education teachers, gifted teachers, speech and occupational therapists have left as any other group. And they’re leaving at a much faster rate this year than last. 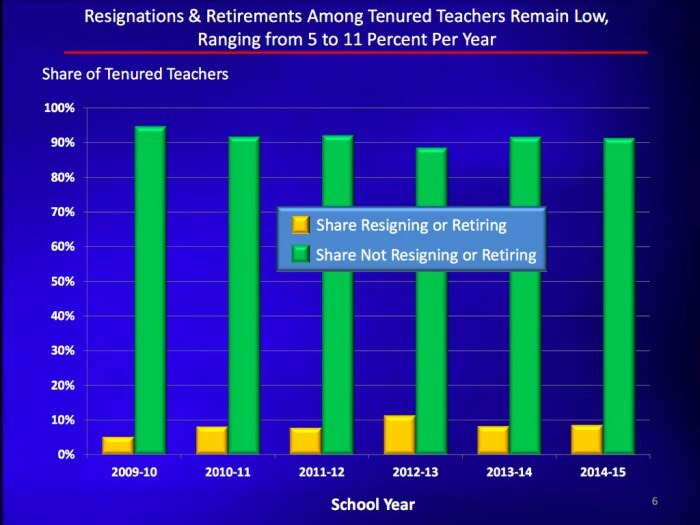 In 2014-15, 17 SPED teachers resigned or retired. In 2015-16, that number jumped to 65. It seems it’s a hard to retain position as well. They’re running out of this district nearly four times as fast as they did last year. You can see the other disciplines above. If you break the departures down by school, we see another interesting pattern: two of the best high schools in the state are having a tough time keeping teachers. Huntsville High School current lists 105 teachers on its website. Grissom High School lists 108. Over the past two years, HHS has lost 36 teachers and GHS has lost 33 to resignation or retirement. A third of the faculty has turned over in two years. Even more troubling is Rolling Hills Elementary, Dawson Middle, and Mt. Gap P8. Rolling Hills list 38 teachers on its website currently, and it has lost 29 to resignation and retirement. Mt. Gap has 56 teachers and has lost 22 over the past two years. This has been an impossibly difficult post to write. I know a great many of the 559 educators who have left our district over the past two years (as well as the countless others that left the three years prior). Many of them represent the best educators I have ever known. And their experience is irreplaceable. This past Saturday morning, Weekend Edition Saturday ran a story called, “Special Needs Teacher Comes to the Rescue On Flight.” I would highly suggest you give this brief story a listen if you care about education at all. So I guess my instant reaction as a teacher and special needs teacher of nearly 20 years – that I knew that the relationship was the most important thing that I needed to gain with this little boy. And so not really looking at anyone else or the emergency, just connecting with this little boy. And this was not just me. This was what teachers do. This is what they do in their classrooms every day. They problem solve, and the connect with children on a daily basis. And any one of my colleagues and friends who are teachers would have done exactly the same. This is why I mourn the loss of 559 teachers over the past two years and the 393 teachers we’ve already lost this year alone. These teachers’ experience at problem solving and connection will take us a decade to replace. I think Dr. Wardynski has been very successful, assuming his goal was to “fundamentally transform” the best school system in Alabama. I should also include the enablers … aka … School Board … aka … speak no evil, see no evil … hear no evil. Do we even need a School Board??? While it is sad that we are losing so many teachers, I want to point out something positive. Lakewood Elementary is Title 1 and a lower performing elementary school in Huntsville. They are one of the lowest on the list of teachers leaving the schools. As a teacher at Lakewood, I believe that this low number of teachers leaving is a direct representation of the leadership of the principal, Fredrick Barnes. Mr. Barnes is an AWESOME principal to work for and teachers at Lakewood are relatively happy. It is a tough neighborhood and there are definitely students with severe challenges, but the principal is steady and consistent. The fact that they haven’t moved Mr. Barnes from Lakewood in the past 8 or so years (?) is directly related to the teaching culture at the school. While other schools have a new principal every two or three years, Lakewood has stayed the same and the improvements made in these years are remarkable. Lakewood is no longer on the state’s failing school list and was even recognized for their high Schoolnet test scores this year. I am proud to be a Lakewood Lion where I am valued and validated as a teacher! I’m sure the good Colonel understands that when a unit loses 30% of itself, it is “combat ineffective”! What does that make HCS under his leadership? Shameful! The city of Huntsville should be ashamed to have allowed this to occur. Thank you for showing everyone the truth and for all your hard work! How does this compare to the national average of attrition with educators? The district has about 1,300 teachers. The national attrition rate is around 7.7%. That works out to about 100 teachers in Huntsville. Our attrition rate for 2015-16 is three and a half times that. If you add in the teachers terminated every year (on May 20, 2015 that number was 93), that raises the attrition rate to about four and a half times the national rate. When you hire a superintendent from the Eli Broad Institute, who has only ever worked in the military and financial management, and was never an actual classroom teacher….what did you expect? Your point is well taken. This Broad superintendent was hired by three people: Dr. Jennie Robinson, Mr. David Blair, and Mr. Topper Birney. The first two were primarily responsible for his hiring. 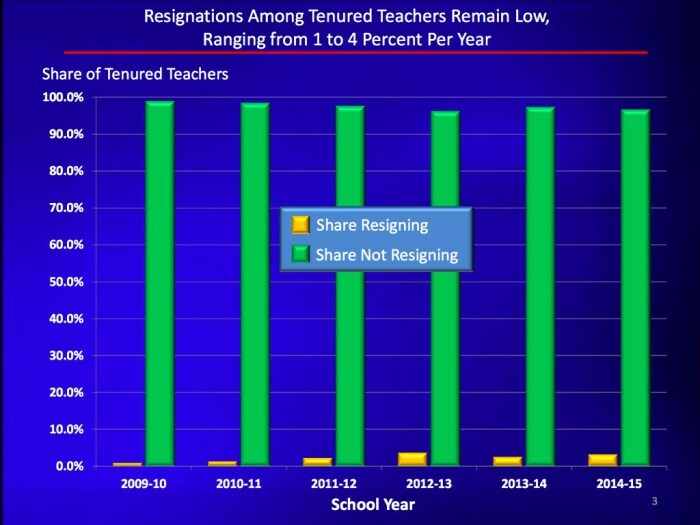 Russ – don’t forget about the 100s of teachers who have been involuntarily dismissed. I haven’t. I just don’t have clear data on them in these reports for some reason. On May 20, 2015, the superintendent recommended 93 teachers and 3 certified personnel for termination. I do not seem to have the report from 2014 at the present time. That raises the number gone from 559 to 652. True. And we are never given a reason why. I was told that by law, I couldn’t be given a reason. All I was told is that the Board unanimously approved my contract termination. How do people I have never met and who have never met me have the authority to do that? If they give you a reason, then you can sue them if you challenge the reason you give. But yeah, it’s completely unfair.